The Jeff George Agency, Insurance and Financial Services has partnered with Burleigh Manor Middle School (BMMS) and Centennial High School (CHS) to support innovative technology programs in the classroom and to provide recognition for staff members. 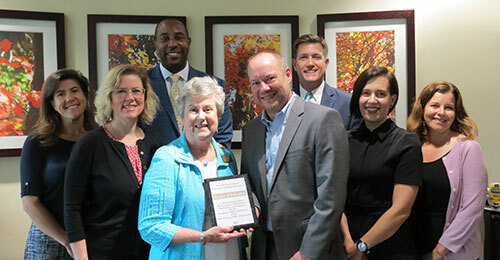 The partnership was formalized with an official partnership signing on Monday, September 17 at the Sheraton Columbia Waterside Restaurant in Columbia, Maryland. Under the terms of the agreement, the agency will collaborate with BMMS and CHS staff to provide support for various STEM programs, including hands-on technology support. The Agency will provide virtual reality technology equipment for BMMS, enabling students to learn with cutting-edge educational applications. BMMS will be the first HCPSS middle school to benefit from virtual reality learning. The Agency will participate in STEM and business-related club activities at CHS by providing networking support for the Computer Science Club and business mentoring for the Blue Ocean Entrepreneurship Competition, the largest student-run high school entrepreneurship competition in the United States. Agency representatives will also provide guidance for BMMS and CHS teachers interested in submitting grant proposals through the Farmers Insurance Thanks America’s Teachers program and will provide staff appreciation meals throughout the school year to recognize teachers for their valuable work. Howard County Board of Education Member Sandra French, HCPSS Community Superintendent Pat Saunderson, Performance, Equity, and Community Response Officer Ron Morris, Burleigh Manor Middle School Principal Mikaela Lidgard and Centennial High School Principal Cynthia Dillon joined The Jeff George Agency, Insurance and Financial Services Owner Jeff George to sign the formal partnership agreement at the September 17 event. The Jeff George Agency, Insurance and Financial Services serves Ellicott City, Columbia, Northern Howard County, and Carroll County by identifying the insurance coverage and financial strategies that best fit customers’ needs and financial goals.